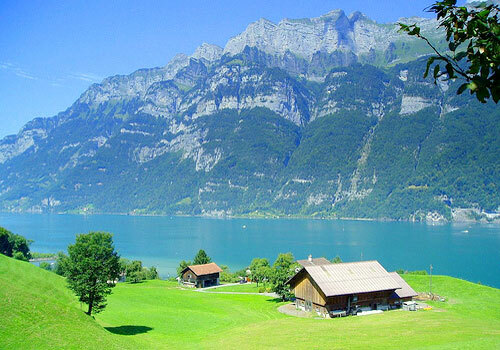 Interlaken, meaning 'between the lakes', is the tourist capital of the Bernese Oberland. As a popular holiday spot it is superbly situated between the lakes of Thun and Brienz, offering a variety of water-based activities during summer, and access to an endless amount of winter sports in the surrounding mountains of the Bernese Alps and its valleys. Linked to numerous holiday resorts and villages by a series of mountain railways and cablecars, Interlaken has a myriad of slopes and trails in many different areas offering skiing, snowboarding and hiking, as well as connecting to the famous cog railway leading to the plateau of the Jungfrau Mountain. During winter, skiers can take advantage of the town's low prices, avoiding the in-season costs of higher altitude ski resorts. With its many fine hotels, nightlife and dining opportunities, numerous excursion possibilities and first class transport connections, Interlaken is an ideal all-round holiday destination for both winter and summer, for skiers and non-skiers alike. Claiming to occupy the sunniest plateau in the Swiss Alps, the twin villages of Crans and Montana are perched 4920 feet (1,500m) above the Rhone Valley. Crans-Montana provides the best of both a mountain village and modern Swiss ski resort, offering an Alpine shopping paradise, and easy access to nearby attractions like the museums of Sierra, the underground lake near St-Léonard, and the glacier at Plaine Morte. The resort has a glitzy reputation and enjoys a fashionable nightlife. Crans-Montana offers many summer activities, including water skiing, swimming, mountain climbing, hiking, and a championship golf course. The largest lake in central Europe that is shared by both Switzerland and France, Lake Geneva (Lac Léman to its French-speaking inhabitants) has for decades drawn visitors to its shores. Attracted by the alpine panorama, quaint wooden chalet villages, vineyard-covered slopes and sailboats skimming across the blue waters, many famous writers, musical composers, actors and poets came to settle and the area has become something of an inspiration to the arts. Situated in the westernmost district of Vaud, the region contains a diversity of attractions and activities, from wine-growing villages and mountain ski resorts, picturesque castles, and magnificent cathedrals, to low-key lakeside resorts, boat cruises, and cosy fireside pots of fondue. Sophisticated shopping and cultural life can be found in the cities of Geneva and Lausanne, with sweeping views across the sparkling lake to the Alps and the distinctive pinnacle of Mont Blanc. Among the vineyards and affluent villas clinging to the slopes lie the lakeside towns of Vevey and Montreux, the pearls of the Swiss Riviera. Scenic winding roads stretch along the shores, and train trips offers outstanding views, while below steamers crisscross the waters of Lake Geneva, offering a variety of ways to experience the splendour of its location. Located on the shores of Lake Geneva, the energetic city of Lausanne is built above the lake on a sequence of tiers connected by a small metro. The upper or Old Town contains the grand Gothic cathedral, Notre-Dame; its turreted towers a well-known symbol of the city. The lower town on the lakeshore was once the small fishing village of Ouchy and is now the prime waterfront area with outdoor dining and cafés, promenades and sporting activities. The gardens around the Quay d'Ouchy are home to the city's foremost attraction, the Olympic Museum, containing a wealth of sporting memories and a collection of unique objects pertaining to the Olympic Games from its beginning until the present. Lausanne relishes its importance as the Olympic World Capital and headquarters of the International Olympic Committee. 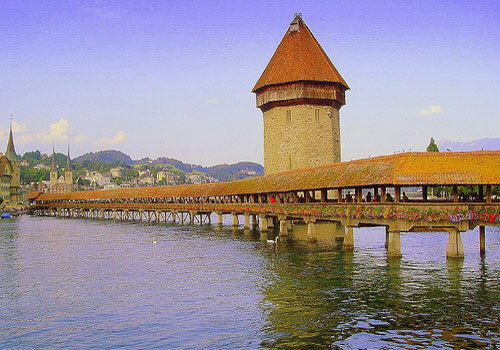 One of the best-maintained medieval castles in Europe, the 13th-century Château de Chillon is the most visited historical building in Switzerland. With its stunning lakeside location near the chic town of Montreux, jutting out into the water and framed by mountains, it is one of the most photographed castles in Europe. An important fortress in the Middle Ages, it was positioned to control the narrow passage between mountains and lake, protecting the major north-south route. 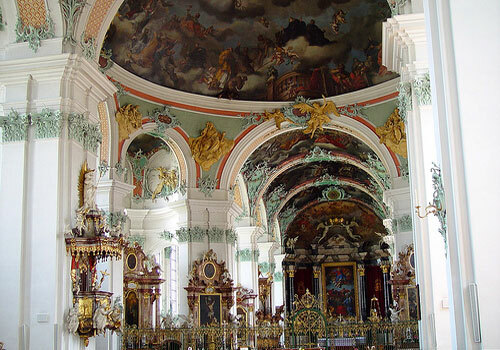 It was also the favourite summer residence of the Counts of Savoy; while later, it served as a state prison. Visitors can tour the dungeons where the castle's most famous prisoner was chained for four years, the priest François Bonivard, a supporter of the Reformation. The fortress became famous when Lord Byron wrote about Bonivard's fate in an inspired poem entitled . Besides the dungeons, visitors can wander round the towers and courtyards, discover narrow secret passages, and see the grand knight's halls, frescoed chapel, luxurious bedchambers and rooms containing medieval weapons, furniture and paintings. One of the tallest fountains in the world, the Jet d'Eau is a Geneva attraction that cannot be missed. Projecting 460 feet (140m) into the air at a speed of 124 miles per hour (200km/h) and pumping 132 gallons (500 litres) of water per second, the fountain was initially established to release pressure for hydropower generation on the Rhone River, but was so loved by the populace that in 1891 the city created a permanent fountain. As Paris has the Eiffel Tower and New York has the Empire State Building, Geneva has the Jet d'Eau. For a breathtaking and romantic sight, visit at night, when the fountain is lit up. Leysin has a reputation as one of the most family-friendly ski resorts in Switzerland, offering children's activities year-round at more affordable rates than its fashionable neighbours in the Rhone Valley. There are a number of off-piste diversions, including excursions to Lake Geneva, the museums and castles in Aigle, and the igloos in Teepee Village. The mountain provides a spectacular setting for hiking, mountain biking, horseback riding and rock climbing in summer. There are a number of good restaurants, including the glass revolving Le Kuklos, which has a panoramic view of the region, and a few bars in town. While the village is removed from the larger skiing areas, skiing in Leysin's 37 miles (60km) of pistes provides challenges ranging from nursery areas to two black runs for experts, and 24 miles (39km) of cross country trails. There is a ski school that arranges heli-skiing trips, and the glacier at Les Diablerets is included in the ski pass. Leysin is a major snowboarding destination, with a snowboard park and half pipe that have hosted many professional competitions. Opened in 1994, the cutting edge Museum of Modern and Contemporary Art refuses to conform and as former museum director Christian Bernard says, the museum 'is not here to present the acceptable face of contemporary art'. With modern works dating from the 1960s to the present day, exhibited in a turn of the century factory, visitors to MAMCO will spend hours marvelling at the range of contemporary art that covers three floors. The Museum of Modern and Contemporary Art constantly reinvents itself, changing its exhibits and interior construction three times a year. The works of famous Dadaist Marcel Duchamp are on display all year round. Comprising of three sections, the captivating Museum of Art and History explores the passage of western culture and international civilizations with over 7,000 pieces covering archaeology (Roman, Greek, Egyptian and Etruscan), fine arts (paintings from the Renaissance to modern times) and applied arts (found objects from the Middle Ages to the 20th century). One of Geneva's largest museums, the colossal Museum of Art and History was built at the beginning of the 20th century, between 1903 and 1910. When visiting lookout for paintings by legendary artists Van Gogh and Renoir. The holiday destination of Grindelwald is a picturesque, traditional mountain settlement at the foot of the Eiger Mountain, surrounded by spectacular alpine landscapes. Popular as both a summer and winter holiday spot, it offers miles of slopes and hiking trails across the Alps, and for non-skiers there are a huge variety of winter activities, from tobogganing to groomed winter hiking tracks. For skiers there are three distinct areas to choose from, with slopes for beginners, intermediates and the challenges of the Eiger glacier for the experienced; as well as lift links to Wengen and Mürren, making this one of the best holiday resorts from which to explore the Jungfrau region. Skiing in Grindelwald is best suited to intermediates, and there are plenty of long, gentle runs to keep them busy. There are plenty of options for true beginners as well at the Bodmi Nursery slopes. While advanced skiers won't find much, Grindelwald boasts the famous Lauberhorn World Cup downhill run, as well as the near-vertical Kanonenrohr. The resort is part of the Jungfrau region, and shares mountain space with Wengen. There are roughly 12 miles (20km) of cross-country tracks. When people in Geneva say they go to Museum, they mean The Natural History Museum. This museum presents an educational look at the world of nature with special emphasis on the ecological history of Switzerland. Included is a life size model menagerie of bears, foxes, alligators, aardvarks and other animals from around the globe, as well as a complete collection of every mineral and plant indigenous to Switzerland. There is also a special children's area. A great place to bring the kids, the Musée d'Historie Naturelle contains numerous historical collections left to the museum by world-renowned scientists, such as Lunel, Saussure and Fatio. Children will be amazed by displays of animals and specimens including a leatherback turtle, giant spider crabs, tiger sharks and even a coelacanth. Advertised as the 'slowest express train in the world', the Glacier Express is also the most panoramic, and is a breathtaking way to experience the magnificence of the Swiss Alps. The seven and a half hour journey begins daily from Zermatt. The red mountain train crosses more than 291 bridges, winds its way through 91 tunnels and seven valleys and over the 6,670ft (2,033m) Oberalp Pass to the resort of St Moritz, in a spectacular feat of mountain engineering. The train is equipped with large windows for clear viewing and the scenery, including mountain panoramas, quaint villages and wooden chalets, forests and alpine pastures, is stunning. A dining car provides lunch and the mini-bar contains tilted wine glasses to counter the lean of the carriages along the steep mountainous route. The train can be taken in either direction, and if time is short it is possible to travel along a short section of the route, but either way it is advisable to make advance bookings as the train is very popular. There are several departures a day during summer and one a day in winter. With panoramic views of the Rhone Valley, Veysonnaz forms a part of the Four Valleys ski area together with Nandez, Verbier, Thyon and La Tzoumaz. A more affordable alternative to fashionable resorts like Verbier, the pretty town of Veysonnaz has managed to retain its Alpine charm with traditional architecture and events like the June Cow Processions. There are a range of activities for non-skiers in both summer and winter, including attractions like the pyramids of Euseigne and the Grande Dixence dam. The town itself has a number of restaurants and bars, as well as a few shops and a recreation centre. The Four Valleys ski area has over 250 miles (400km) of runs, which provide ample off piste opportunities for experts, including the Tortin snow bowl. There are also runs for intermediates and beginners, and the runs in general range from 1,640 feet (500m) to 9,842 feet (3,000m) in elevation, though heli-skiing is available to the Pigne d'Arolla at 12,467 feet (3,800m). The 1936 Neypark at La Choux is a haven for snowboarding in Veysonnaz, featuring a skate-style pyramid and a good selection of rails.